​Over the years, I've tried my hand at poetry, short stories, magazine articles, and memoir writing. Some end up in print while others remain in my handwritten notebooks hidden away, but either way, I like to think of these musings as 'Fuel for the Soul'. They are my way of celebrating joy, channeling pain, and recharging the batteries for the next phase in life. Here are some of these snippets. I was relentlessly bullied in high school. Verbal taunting as I walked the corridors wore me down, giving me first hand experience of being on the receiving end of this type of negative behaviour. Now, I am a prominent anti-bullying advocate, speaking in various forums and schools about the impacts of bullying and the power of resilience. 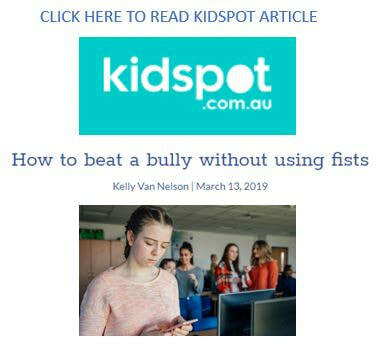 Magazines such as Now and Kidspot have featured my non-fiction articles on the prevention of bullying. For schools interested in booking an assembly or classroom session, please contact me via email for discounted package prices: kellyvannelsonauthor@gmail.com. Outside of spending time with family, writing, and full-time corporate work, one of the things I am incredibly passionate about is motivating high school students to chase their dreams, no matter what obstacles they might face. I am an anti-bullying advocate and promoter of gender equity initiatives. At STEM events, you'll often find me key note speaking or on judging panels, encouraging girls to study Science, Technology, Engineering, or Mathematics. I try to raise awareness about what opportunities are out there if they adopt a hard working ethos and are passionate about achieving their goals. I firmly believe that if you aim for the moon and miss, you just might land on a star! Starting out life, we were a working class family, living in a council estate during the Thatcher era. There was a small, derelict, coal mine at the top of the street. Until recently, I then lived in beautiful Western Australia, which ironically has an economy fueled by the mining industry. Now I am in Sydney's northern beaches, writing every day while also working for one of the world's largest multinationals securing work for 700,000 people daily. I feel blessed to have enjoyed such varied experiences. Occasionally, I look back on bleak elements of my childhood. Being verbally bullied in the high school corridors was a particular low point. Yet these moments are what made me resilient and an advocate for change today, supporting anti-bullying and mental health awareness initiatives through both my writing and my corporate work. In 2019, a flash fiction piece of mine, written on the theme of kindness, will feature in an anthology published by Lapidus International, a not-for profit organisation in the UK. Lapidus is a warm community of professionals who use words and expressive arts to promote well-being and good mental health. What a great feeling to be able to positively contribute back to society. ​This was my very first poem to ever make it into print in a compilation written by UK writers, titled Poetry by Moonlight. At the time of writing this, I was exploring different writing styles and researching the death of a child and the impact of such a tragedy on the family. ​In 2010, my first short story was included in 'From The World's Edge,' an anthology published in the UK by The Short Story Society. The central character is a reclusive woman who is afraid of her past and is surviving on government benefits.